There is no empirical evidence to support climate alarmism. Malcolm Roberts vs the hack alarmists. Intrepid fellow that he is, Malcolm Roberts, newly elected senator on the PHON ticket, does not shy away from going into the Lion’s Den, or should that be the scalded cat’s litter-box, of the ABC. The ABC is a notorious and biased advocate for the scams of alarmism and renewable energy. The ABC can be expected to gun for Malcolm as Barrie Cassidy did in a desultory fashion on Insiders. Malcolm was more than a match for Cassidy as was David Leyonhjelm. While both Roberts and Leyonhjelm made a fool of Cassidy over the repugnant and sinister S.18C an important distinction between Leyonhjelm and Roberts over alarmism was apparent. Roberts opposes alarmism and renewables because they have no science to back them up and therefore measures like a CO2 tax have no justification. 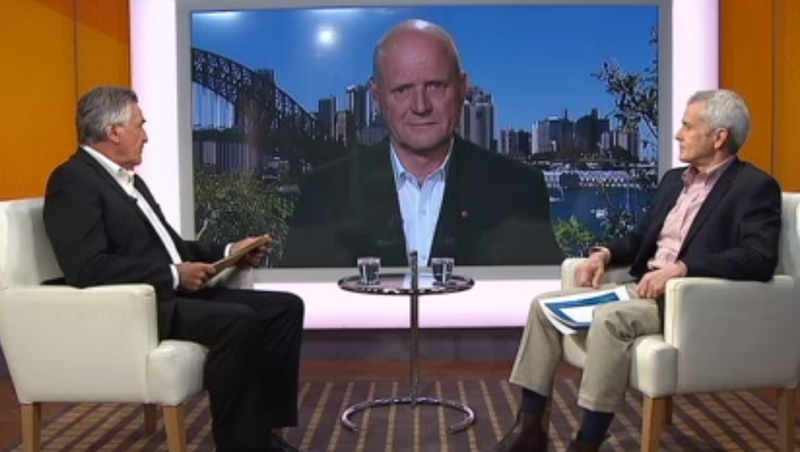 Leyonhjelm on the other hand does not quibble with alarmist science. He opposes a CO2 tax because no-where else in the world is this being done and therefore it would be fool-hardy for Australia to go it alone. An important distinction. renewables it would be hilarious. The experts the hack got to repudiate Roberts were: JohnCook and Steve Sherwood. I have had some stoushes with Cook who from my experience turns up, adopts a condescending tone and then disappears when awkward questions such as how his paper on the consensusinstead proves there is no consensus, are asked. At Hack Cook attempts to contradict Roberts reasonable conclusion that there is nothing unusual about the current climate by using the 4 atomic bombs comparison. This comparison is typical of alarmists. They have no facts so they resort to grotesque images and hyperbole. Supposedly human influence on the environment is like 4 atomic bombs going off every second. This is beyond stupid and it is alarming that not only people like Cook use this rubbish as Joanne Nova shows but supposedly top academics like Mike Sandiford. I deal with Sandiford at a previous post here which shows what is really behind this absurdity: misanthropy. Finally, Hack wheels out the big gun of Steve Sherwood to refute Malcolm’s claims that humans are not causing the increase in CO2. Sherwood is infamous; he has been inventing the Tropical Hot Spot (THS), the Holy Grail of alarmism, for years. As far back as 2008 Sherwood was discovering a THS where none existed. This 2008 paper typifies alarmism. Sherwood repudiated the instrument data because it did not show a THS and developed a windshear model which showed if there was windshear there would be warming. The stupidity of this was the instruments which were not good enough for temperature were used to establish windshear and model predicted temperature. In short he invented the evidence and called it modelling. And Sherwood keeps doing this as Jo Nova noted. As I explain if the proportion of Human CO2 is not increasing it must mean that nature is causing the increase. This is consistent with Henrys Law as Jamal Munshi explains in his paper. But facts are irrelevant to alarmists. They believe in their ideology. This is why we need someone like Malcolm Roberts in the senate. 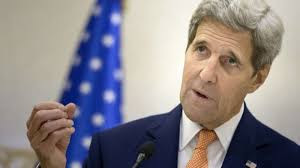 He won’t change their beliefs but hopefully he will convince the people in the middle and if enough people voice their opposition to this oppressive ideology of global warming the true believers will be removed from their undeserved positions of influence. there is no empirical evidence to support alarmism. Thanks, Paul. However the thanks must go to Anthony Cox who wrote the piece. Nice Placement on the Galileo Movement Daily! I attempted to email this to Senator elect roberts, but the one Nation address no longer seems to be operating, so was awaiting his electoraloffice to be set up. However I will take the oportunity to post it here. 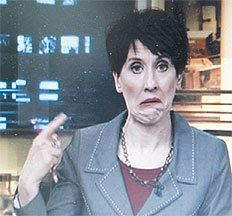 I have noted your remarks on the ABC Lateline and Insiders programs concerning climate change. In particular I noted your request to Mr Cassidy for empirical evidence of anthropogenic global warming. 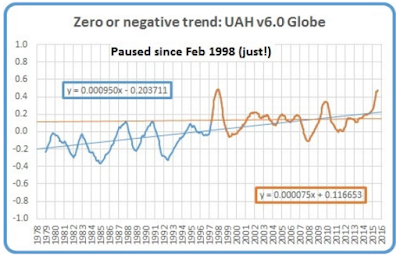 I will limit myself to two graphs of temperature and atmospheric CO2 data and how they relate to your statement that there is no empirical evidence for ‘unusual’ temperature trends. This graph of global temperatures from NASA’s Gistemp data set and atmospheric CO2 concentration as measured by the Muana Loa site in Hawaii which began operating in 1958. The sawtooth pattern of the CO2 concentration is due to the growing and dormant seasons in the northern hemisphere, where most of the worlds plants, particularly those in deciduous forests. are located. The Gistemp data gives a value for the Equilibrium Climate Sensitivity (ECS), the rise in temperature with doubling of CO2 concentration of 2.5 °C, within the IPCC range predicted by theory of 1.5 to 4.5 °C. The satellite data give ECS Values of 2.2 and 1.9 °C respectively in statistical agreement with the Gistemp data and also within the IPCC range predicted by the theory. The observations therefore match the theory, and do not do so if only “natural” rather than anthropogenic forcings are considered. 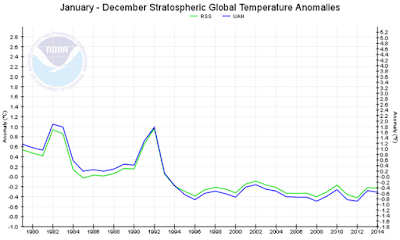 In respect of the temperature indices, GISS is also clearly an outlier and there is no doubt that there is a pause, at least with UAH, and RSS before the recent amendment to their algorithm as Ken Stewart’s analysis shows. Do you mean this John Cook? All Ms Nova’s graph in the first link shows is that over time determinations of the selected ECS appear to be converging on a particular value within the original IPCC range of 1.5 to 4.5 °C. One would hope that this would be the case , even if the value being converged on is in the lower end of the range. It is incorrect to draw some kind of trend line and extrapolate that at some time in the future will be zero. The second link is says that if the ECS is 3 0 or 2.5 °C it is almost impossible to restrict the rise in temperature to 1.5 °C above pre=industrial levels. I agree with that assessment. In fact the temperature rise in the graph of 1.25 C since 1800 with a CO2 concentration rise from 280 to 400 ppm if the ECS is 2.5 °C is in agreement with my determination of an ECS of 2.50 ± 0.35 °C based on a Gistemp temperature rise of 0.907 ± 0.12 from 1958 to the end of June 2016 and a rise in CO2 concentration of 315 ppm to 404 ppm over that period. But in any case this does not affect the case that there is no basis for Roberts’ statement that the evidence shows that there has been no unusual warming. Similarly, your other links, while interesting are not relevant on this point. 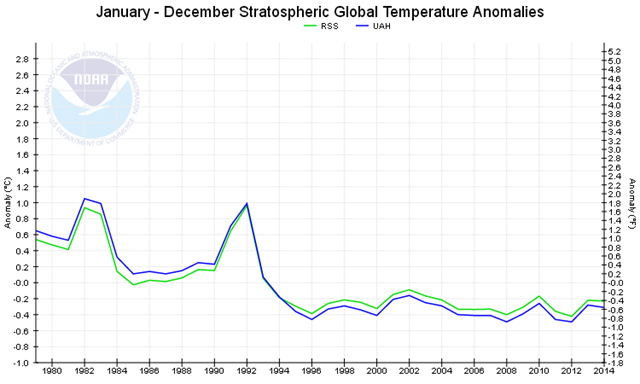 That is there is empirical evidence that there has been unusual warming , contrary to Roberts’ claims. Where a is albedo, Fo is the total solar radiative flux [w/m2] and Hr^2 is the cross-section of Earth. Where e is emissivity, Q the Stephan-Boltzman constant, 4Hr^2 the total area of Earth and T the temperature in K.
The difference between the 2 temperatures [blackbody and real, that is with a greenhouse atmosphere] is 15-(-18)=33C; the greenhouse temperature. This a lower figure than calculated by either F&R or Hansen et al but I still think it is too high. Why? Clouds. 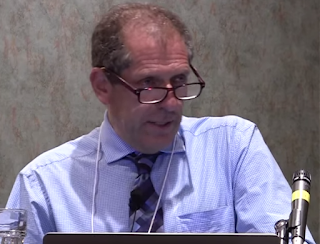 "Apparently we want to set Earth’s climate control knob at 1.5 C above the Little Ice Age...If the climate modelers are right, and equilibrium climate sensitivity is 3 C, the CO2 concentration we need to aim for is … wait… 400 ppm. 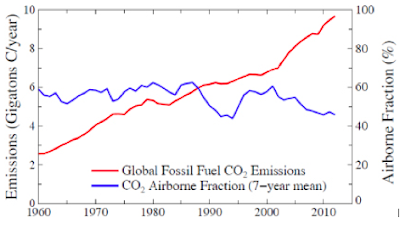 How many years have we got to change the whole “human emissions” equilibrium and discover 100% clean energy? Answer: No years." Ms Nova is assuming that everyone is using the figure of 3 C for an ECS. That is not true. The IPCC range for that value is 1.5 to 4.5 C, but the actual value is probably at the lower end, between 2 and 2.5 C as the second link shows (see my reply to Alan below) in line with my empirical calculations based on temperature and CO2 data. Ms Nova's argument is that at the current value of 400 ppm, we are already 1.5 C above the pre-industrial temperature. Well, as we are not 1.5 C above the pre-industrial level, with a CO2 concentration of 400 ppm, Ms Nova's assumption that the ECS is 3 C appears to too high. And in fact I have undertaken the reverse procedure, taking the actual CO2 and temperature data for periods of time,from 1959 when Muana Loa CO2 data began and matching it with Gistemp data, and again from 1979 when satellite data became available. The error margins for short term data are high but the calculated ECS values of 2.5± 0.4 °C and 2.2 ± 0.9 °C are within the IPCC range. But if you look at data going back to 1850,you get an ECS value of 2.04 ± 0.07 °C. The error margin is lower, but in statistical agreement with the data for shorter periods. Here the warming is expressed in the energy per square meter at the surface, which converts to an increase in temperature of 1.1 C with doubling of CO2 concentration. What makes the cdetermination of the ECS for the earths amosphere are the feed back mechanisms, positivr and negative. One positive feedback is that the warmer the atmosphere the more water vapour it can hold, and H2O is itself a greenhouse gas. further warming the atmosphere. On the other hand that increased water vapour can form clouds, which shield the surface form the sun - a negative feedback. These are just two mechanisms, and the difficulty in working out how much feedbacks add to or subtract from the warming due to increasing CO2 alone is why the range has been stuck at 1.5 to 4.5 C for decades. But I agree with Ms Nova that it is unlikely that CO2 concentrations can be reduced enough to prevent the temperatures from exceeding 1.5 C above pre industrial levels. Anthony Cox reply to Dr Shehan. Philip, you are tying yourself in knots. And misrepresenting what Jo is saying: which is even if there is a delay in the effect of the heating from CO2 as defined by the ECS, which there is not, we are more than ½ way there. That’s all. And the point of the declining estimates for climate sensitivity are nothing more than the IPCC and climate researchers realising the so-called heating effect from 2xCO2 is not as great as they originally estimated. As for the ECS and the supposed delay in the heating effect from 2xCO2. This is wrong for a number of reasons. 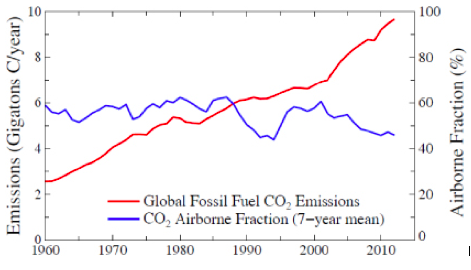 1 CO2 residency, the period CO2 lasts in the atmosphere, is much less than alarmism estimates. My first comment provides many sources for this. What these show is the oceans are NOT storing the missing heat. The climate responds fairly quickly to forcing and does not store heat. So to recap: even if you accept the idea of ECS, which is simply a delay in the heating response to 2xCO2 we are more than 50% past the figure which is DECLINING in the estimates. But there is strong evidence against a delay in climate response and therefore an ECS because CO2 does not last as long as alarmists have estimated and heat is not stored in the oceans. Anthony: Half way where from where? Indeed, so why do you and your manipulated, alarmist scare-mongering peers constantly produce them to sell to the naive public, along with all your other lies and infantile, human-induced climate change nonsense? Alan, you are failing to distinguish between graphs which contain data which lend themselves to extrapolation and those that do not. Ms Novas graph shows various determinations of the ECS which appear to be converging on a value within the expected range. that is what one would hope would happen as understanding and data accumulates. the fact that it is converging on a value at the lower end of the expected range does not mean that you can take some line and extrapolate outside the range. There is no theoretical reason as to why the figure should decrease with time. Especially when the data on the graph appears to have selected high determinations in earlier years and ignored lower values to give a downward slope to the trend line. For example here are just some of the values that do not appear on the graph. 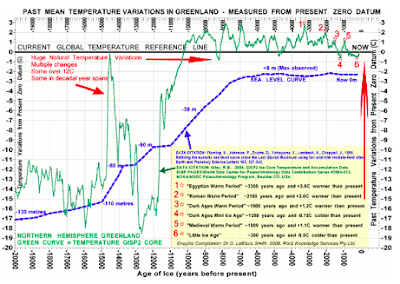 Lorius 1990 examined Vostok ice core data and calculates a range of 3 to 4°C. Hoffert 1992 reconstructs two paleoclimate records (one colder, one warmer) to yield a range 1.4 to 3.2°C. Hansen 1993 looks at the last 20,000 years when the last ice age ended and empirically calculates a climate sensitivity of 3 ± 1°C. Gregory 2002 used observations of ocean heat uptake to calculate a minimum climate sensitivity of 1.5. 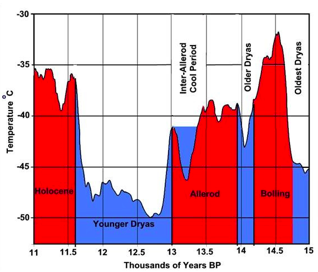 Chylek 2007 examines the period from the Last Glacial Maximum to Holocene transition. They calculate a climate sensitivy range of 1.3°C and 2.3°C. Tung 2007 performs statistical analysis on 20th century temperature response to the solar cycle to calculate a range 2.3 to 4.1°C. Bender 2010 looks at the climate response to the 1991 Mount Pinatubo eruption to constrain climate sensitivity to 1.7 to 4.1°C. Other graphs show data where there is an expected theoretical relationship between the values on the vertical and horizontal axis. For example, there is an theoretical expectation that if atmospheric CO2 levels rise, atmospheric temperatures will rise. And the ECS is a paramater value that gives a value for the relationship. The mathematical relationship between the quantities allows one to extrapolate along the line to predict what the future temperature willbe for a given future CO2 concentration. Keep up the good work Phillip! Maybe soon we can have a Nurenburg type trial to prosecute all these lunatics and enviromental vandals for the harm they have done our planet at the behest of big coal/oil and their own stupidity. Thanks for your highly intelligent and informed comment Mr Anonymous. At least us lunatics have the guts to comment using our names rather than anonymously. You are actually a devout lunatic yourself, if you believe any of this total garbage promoting the CAGW HOAX. Yes like it or not, deny it all you want, but 'big coal/oil' gave you the lifestyle you are enjoying today and without them you probably wouldn't even be here. If you want to exist in your 'clean green', fossil fuel energy free dystopia, you can do it right now, without dragging the rest of us down to your level. You leftist CAGW worshippers hate capitalism even though you reap the benefits. If 'big coal/oil (such a childish expression) is so terrible, why depend upon it any longer, contributing to the CAGW 'problem'? You can divorce yourselves from it and totally stop contributing your share of that evil CO2, right now! So GO! Buy some land somewhere and make sure there's no electricity provided by the local (big coal/oil powered) electricity supply, no (fossil fuel powered) cars, trucks, motorbikes, lawnmowers - anything that burns fossil fuels and no roads; and live in your clean, green utopia without it. Prove to us lunatics and environmental vandals how great your green utopia without depending 'big coal/oil' really is and you might even convince us to (NOT!) join you. Whilst you are still living in a world where your evil 'big coal/oil' prevails, you are all hypocrites so you should either shut up, or get out of the world that literally runs on the energy source you have demonized. Go and live in your clean, green utopia and enjoy it. Do it now, but you won't drag the rest of us down there with you, mainly because you yourselves would never go there either!